The Courage will have to wait another game to wrap up the NWSL Shield. Sam Kerr will have to wait another game for her record-breaking 17th goal. With several records possible on Sunday night at Yurcak Field in New Jersey, North Carolina and Sky Blue FC played to a 1-1 draw. With a win, North Carolina would’ve clinched the best record in the league and the NWSL Shield. 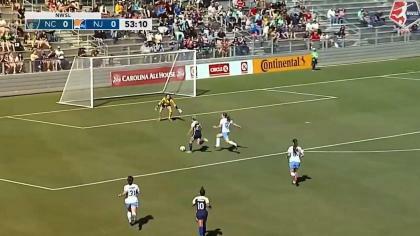 They were also in search of their record-breaking 12th shutout of the season, but Sky Blue FC midfielder Raquel Rodriguez scored in the 75th minute to deny that record as well. It’s the first tie of the season for the Courage, who had gone a record 21 games without a draw. They are now 15-6-1 with 46 points. The tie means they can’t best Seattle’s all-time record of 54 points in one season — though they will get two chances to equal or tie the Reign’s record 16 wins in that same 2014 season. The game for Kerr came just two days after finding out that she was not named to the shortlist for the The Best FIFA Women’s Player 2017. As for the record? “The record means nothing. I don’t care about records. We didn’t make the finals. That’s the main thing,” Kerr said. Sky Blue FC was eliminated from the playoffs two weeks ago. 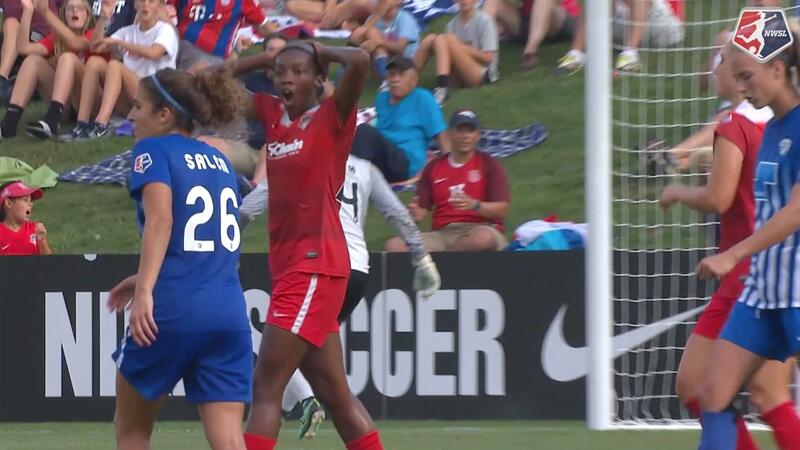 North Carolina forward Ashley Hatch thought she had scored the sixth goal of her rookie season in the 27th minute, but was ruled offside on the play. On the ensuing restart from Sky Blue FC goalkeeper Caroline Casey, Hatch would get her goal. Sam Mewis won the ball at midfield, and Hatch was off to the races. She caught up to it and hit a left-footed shot to the far post to make it 1-0. It looked for a moment in the 60th minute like Kerr had scored her record-breaking 17th goal of the season, but she was offside on the play. Rodriguez evened the score in the 75th minute with some help from Kerr. Casey started for the first time this season as rookie goalkeeper Kailen Sheridan had the night off. North Carolina will play two games this week to finish the regular season. First up is a Wednesday night meeting with the Dash in Texas and then the regular season finale at home on Saturday night vs. the Pride. Sky Blue FC (9-11-3, 30 points) will wrap up their season on Saturday in Boston vs. the Breakers. Match ends, Sky Blue 1, North Carolina Courage 1. Second Half ends, Sky Blue 1, North Carolina Courage 1. Substitution, Sky Blue. McKenzie Meehan replaces Madison Tiernan. Attempt missed. Lynn Williams (North Carolina Courage) header from very close range is close, but misses the top right corner. Assisted by Samantha Mewis with a cross following a corner. Corner, North Carolina Courage. Conceded by Raquel Rodríguez. Attempt blocked. Samantha Mewis (North Carolina Courage) left footed shot from outside the box is blocked. Assisted by Debinha. Attempt blocked. Abby Erceg (North Carolina Courage) header from the centre of the box is blocked. Assisted by Samantha Mewis with a cross. Corner, North Carolina Courage. Conceded by Caroline Casey. Attempt saved. Lynn Williams (North Carolina Courage) right footed shot from the centre of the box is saved in the centre of the goal. Samantha Kerr (Sky Blue) wins a free kick on the left wing. Corner, North Carolina Courage. Conceded by Nikki Stanton. Attempt blocked. Kristen Hamilton (North Carolina Courage) right footed shot from outside the box is blocked. Assisted by McCall Zerboni. Offside, Sky Blue. 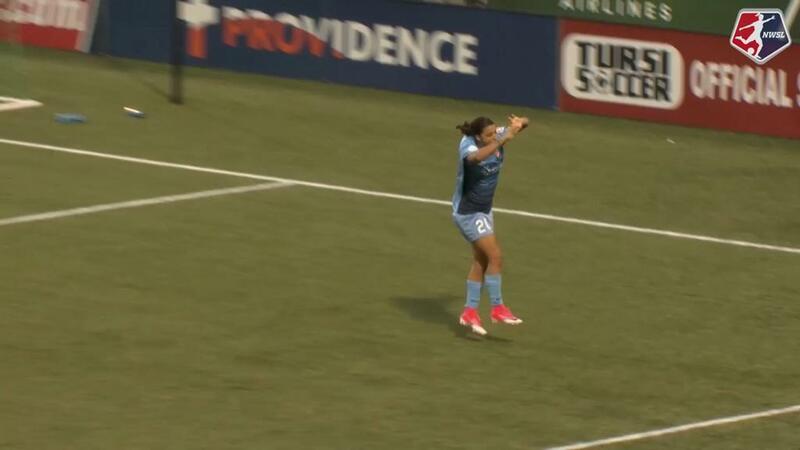 Kelley O'Hara tries a through ball, but Samantha Kerr is caught offside. Offside, Sky Blue. Dominique Richardson tries a through ball, but Samantha Kerr is caught offside. Offside, Sky Blue. Madison Tiernan tries a through ball, but Samantha Kerr is caught offside. Offside, Sky Blue. Samantha Kerr tries a through ball, but Madison Tiernan is caught offside. Goal! Sky Blue 1, North Carolina Courage 1. Raquel Rodríguez (Sky Blue) right footed shot from the centre of the box to the bottom right corner. Assisted by Samantha Kerr following a set piece situation. Taylor Lytle (Sky Blue) wins a free kick in the attacking half. Lynn Williams (North Carolina Courage) wins a free kick in the attacking half. Substitution, North Carolina Courage. Makenzy Doniak replaces Ashley Hatch. Attempt missed. Lynn Williams (North Carolina Courage) right footed shot from outside the box is high and wide to the right. Attempt missed. Samantha Mewis (North Carolina Courage) right footed shot from outside the box is high and wide to the right. Assisted by Denise O'Sullivan. Attempt missed. Lynn Williams (North Carolina Courage) right footed shot from the centre of the box is too high. Assisted by Ashley Hatch. Attempt missed. Kristen Hamilton (North Carolina Courage) right footed shot from the left side of the box misses to the right. Assisted by Abby Dahlkemper with a cross following a corner. Attempt missed. Kelley O'Hara (Sky Blue) right footed shot from the right side of the box is high and wide to the right. Assisted by Madison Tiernan. Substitution, Sky Blue. Raquel Rodríguez replaces Maya Hayes. Second Half begins Sky Blue 0, North Carolina Courage 1. First Half ends, Sky Blue 0, North Carolina Courage 1. Attempt blocked. Taylor Smith (North Carolina Courage) left footed shot from outside the box is blocked. Delay in match Taylor Smith (North Carolina Courage) because of an injury. Ashley Hatch (North Carolina Courage) wins a free kick in the attacking half. Attempt missed. Jaelene Hinkle (North Carolina Courage) right footed shot from outside the box is high and wide to the right. Assisted by Kristen Hamilton. Attempt missed. Madison Tiernan (Sky Blue) right footed shot from the centre of the box is too high following a corner. Attempt missed. Lynn Williams (North Carolina Courage) left footed shot from the centre of the box is just a bit too high. Assisted by Kristen Hamilton with a cross. Offside, North Carolina Courage. Abby Dahlkemper tries a through ball, but Lynn Williams is caught offside. Attempt missed. Madison Tiernan (Sky Blue) header from the left side of the six yard box is too high. Assisted by Samantha Kerr with a cross. Attempt missed. Samantha Kerr (Sky Blue) right footed shot from the right side of the box is too high. Assisted by Mandy Freeman. Attempt saved. Lynn Williams (North Carolina Courage) right footed shot from the centre of the box is saved in the bottom left corner. Assisted by Kristen Hamilton. Goal! Sky Blue 0, North Carolina Courage 1. Ashley Hatch (North Carolina Courage) left footed shot from the left side of the box to the bottom right corner. Assisted by Kristen Hamilton with a headed pass. Offside, North Carolina Courage. Kristen Hamilton tries a through ball, but Ashley Hatch is caught offside. Attempt blocked. Lynn Williams (North Carolina Courage) right footed shot from the centre of the box is blocked. Assisted by Samantha Mewis. Offside, Sky Blue. Maya Hayes tries a through ball, but Madison Tiernan is caught offside. Attempt missed. Denise O'Sullivan (North Carolina Courage) right footed shot from outside the box is high and wide to the right. Attempt saved. Lynn Williams (North Carolina Courage) right footed shot from the centre of the box is saved in the bottom right corner. Assisted by Ashley Hatch with a headed pass. Attempt saved. Lynn Williams (North Carolina Courage) right footed shot from the left side of the box is saved in the centre of the goal. Assisted by Jaelene Hinkle. Attempt blocked. Lynn Williams (North Carolina Courage) right footed shot from the centre of the box is blocked. Attempt saved. Abby Erceg (North Carolina Courage) header from the centre of the box is saved in the top centre of the goal. Assisted by Abby Dahlkemper with a cross. Attempt missed. Nikki Stanton (Sky Blue) left footed shot from outside the box is too high. Assisted by Taylor Lytle. Delay in match Maya Hayes (Sky Blue) because of an injury. Attempt blocked. Samantha Mewis (North Carolina Courage) right footed shot from outside the box is blocked. Assisted by Kristen Hamilton. Attempt missed. Samantha Mewis (North Carolina Courage) header from the centre of the box is just a bit too high. Assisted by Abby Dahlkemper with a cross following a corner.